Observation - Winter Grebe on a sea lough - UK and Ireland. Description: One of a number of overwintering grebes in a shallowish marine estuary (Belfast Lough), regularly diving for food. 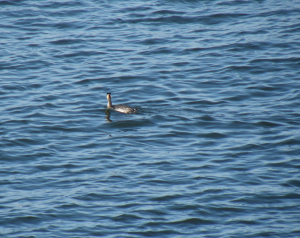 One of a number of overwintering grebes in a shallowish marine estuary (Belfast Lough), regularly diving for food.